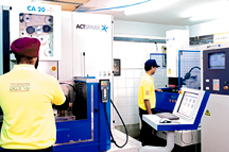 ATC Precision Components pvt. ltd.
ATC has been in business for more than 30 years & has been processing wide array of material ranging from Engineering plastics like Nylon 6,66, 46 (unfilled & reinforced), PBT, PET, ABS, PC, PPS to commodity plastics like PP (unfilled & reinforced), PVC & thermo-set materials like Phenolic , melamine & Urea resins and DMC. We have a comprehensive infrastructure of plastic injection moulding machines ranging from 50 tons to 650 tons sourced from reputed brands including L&T-Demag, Asian Plastics (Taiwan), Multiplas (Taiwan) etc. This also includes special purpose Vertical Rotary Table insert moulding machines & themo-set injection moulding machines. Our aim lies in providing a complete solution to the customer, for which we undertake/outsource other operations as well, like projection welding, sheet metal parts, turned & forged parts, plating etc for use as inserts in moulding or for sub-assemblies. Besides, we add value to the moulded component by converting them into sub-assemblies, for which infrastructure is created as per customer requirements. ATC has been manufacturing plastic injection moulds since inception & has now converted its facility to a commercial tool room. Availability of comprehensive in-house infrastructure provides us with the capability to ensure full control over mould quality & delivery times. Our design facility consists of: UG NX-4 for mould design & manufacturing & Solid Edge for Mould Design. Trained experts with vast Industrial knowledge manage the design section of our tool room. 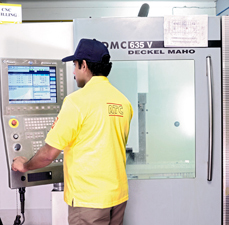 A combination of CNC & conventional machines along with the Design Facility makes ATC a complete Tool Room, capable of delivering the right product at the right time & at the right price.